ARR members who volunteered--even once--at Club events during 2011 were celebrated for their contribution at the Annual Volunteer Banquet held on Thursday, January 19, 2012, at Boston's Gourmet Pizza. In addition to great food, attendees were treated to chances for prizes, based on their level of volunteer participation for the year as tallied by Nicole Buerger, Volunteer Coordinator for the Club. Prizes included several gift certificates to Boston's and to Heart & Sole Sports. Also, each attendee received a great ARR visor--white with the Club's colorful graphic embroidered on the front (being modeled by several people pictured below). 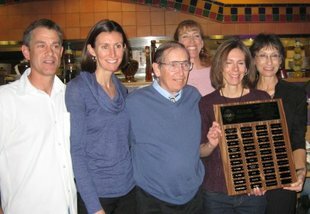 Ed Zanelli and Kelley Garcia, outgoing President and Vice President respectively, played hosts and honored four new inductees into the Albuquerque Road Runners Volunteer Hall of Fame (see photo at right; view all inductees). Each new inductee was presented with a gift certificate to ABQ Running Shop.